Walter Gibson was a pioneer in semiconductor detectors, X-ray optics, and X-ray analysis techniques. 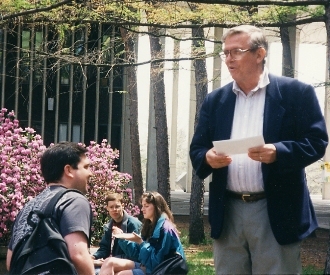 When Walter M. Gibson joined the University at Albany in 1976, it was the beginning of a 25-year career that would see him inspire students and faculty at every level of the university, including his mentorship of nearly 50 doctoral candidates through the long and arduous dissertation process. Gibson, Distinguished Service Professor Emeritus of Physics died at his home in Clarksville, N.Y., on May 15 of leukemia, surrounded by his family. Gibson was recruited to join UAlbany�s physics department from the world-renowned Bell Laboratories, where the list of revolutionary breakthroughs had already reached historic heights by 1976: the discovery of the wave nature of matter, the invention of the transistor and the understanding of radio astronomy. 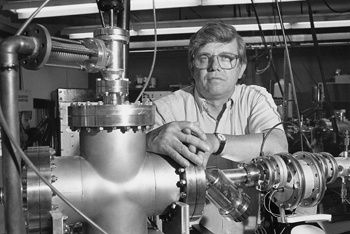 A pioneer in semiconductor detectors, X-ray optics, and X-ray analysis techniques, Gibson became the founding director of UAlbany�s Center for X-Ray Optics in 1990. He served as physics chair for more than a decade, and also stepped in briefly when called upon to serve as the University�s acting vice president for research and dean of graduate studies. Still, his primary focus remained nurturing the creative minds and scientific skills of his students. "Professor Gibson was very warm and caring toward his students," said Professor and Chair of Physics Carolyn MacDonald. "He had 48 Ph.D. students and he regarded each and every one of them as family." MacDonald became director of the Center upon Gibson's retirement. "We worked very closely for a long time," she said. "He was my mentor. He definitely took me under his wing when I was coming up for tenure." Born November 11, 1930, in Enoch, Utah, to the late Murl and Vera Gibson, he earned a doctorate in nuclear chemistry in 1956 from the University of California, Berkeley, where his thesis adviser was Nobel Laureate Glen Seaborg. Gibson founded the University's Center for X-Ray Optics in 1990, and co-founded X-Ray Optical Systems (XOS), Inc. in 1998. He was chief technology officer until his death. His latest research was in collaboration with the Alzheimer's Center of Albany Medical Center. He was honored with the University's first named professorship, the James W. Corbett Distinguished Service Professor of Physics. He published more than 300 articles in peer-reviewed journals. The University at Albany Foundation named Gibson Academic Citizen Laureate in 1992. After his retirement, Gibson remained active as a researcher and University citizen, helping to shape the course of the College of Arts and Sciences as a member of the Dean's Advisory Board. Colleagues remember Walter Gibson as someone who inspired his students, including 48 doctoral candidates. "He regarded each and every one of them as family," said Professor and Chair of Physics Carolyn MacDonald. Gibson had a natural curiosity that led to his interest in science. In his youth in Southern Utah, he performed stunts for Western movies, worked as a sheepherder, and played the saxophone in a dance band. He is survived by his wife Alice; his children, David Gibson, Joyce Gibson, Jon Gibson, Jonna Barnaby, and Jennifer Brown; and was predeceased by his daughter, Susan Gibson. He is also survived by 20 grandchildren and four great-grandchildren. Services will be Thursday, May 21, at 5 p.m. at the Church of Jesus Christ of Latter-Day Saints, 411 Loudon Road, Loudonville, N.Y., 12211. After the service, there will be a potluck dinner at the church. This will be an opportunity to celebrate Gibson's life. In lieu of flowers, donations may be made in Gibson's name to: Alzheimer's Center of Albany Medical Center, Mail code 65, 47 New Scotland Ave., Albany, N.Y., 12208. "All who knew Walt remember him with great affection, admiration, and respect. We offer our deepest condolences to his family and our greatest thanks for his time, wisdom, and legacy with us," said Provost and Vice President for Academic Affairs Susan D. Phillips. 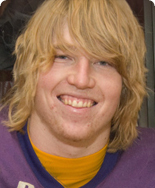 Defensive end Eddie Delaney is living his dream playing Division I football at UAlbany.